RIVERWOODS, Ill.--(BUSINESS WIRE)-- Three out of four consumers, 73 percent, say they are aware of their credit standing and 61 percent say their credit standing is important to them right now, but far fewer check their credit score more than once a year, according to a recent independent survey commissioned by Discover. The survey found that those who checked their credit score most often during the prior year were more likely than those who checked their score less often to say that checking their score had a positive impact on their credit behavior, such as paying bills on time, paying down loans and maintaining low balances on their credit cards. Those who checked their credit score most often were also more likely to report improvements to their score. The survey found that those who checked their score 12 or more times during the prior year were nearly twice as likely than those who checked their score just once to say that their score improved greatly or slightly over that same time period, 61 percent to 32 percent, respectively. Among those who checked their credit score during the prior year—regardless of how many times—39 percent said the leading motivation to check their score was to improve or maintain it. That was followed by 18 percent who checked their score out of concern for fraud or identity theft; 17 percent who checked out of curiosity; and 12 percent who checked before making a major purchase or applying for a loan or credit card. Among those who had not checked their credit score during the prior year, 48 percent said the main reason they didn’t was because there was no need to check it. Other reasons included hesitancy to share personal information, 18 percent; not wanting to pay to check it, 17 percent; and not knowing how or where to check it, 13 percent. 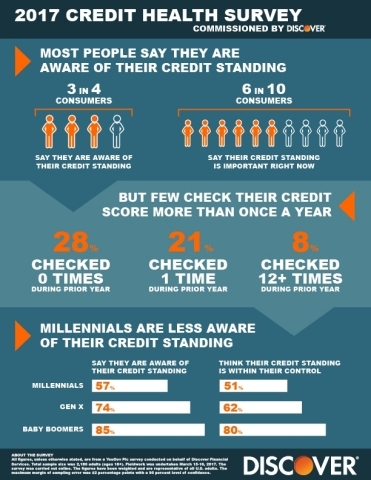 Millennials place less importance on their credit standing than other generations. Among millennial respondents, 54 percent say their credit standing is important to them right now, compared to 63 percent of generation X and 65 percent of baby boomers. Millennials are also significantly less aware of their credit standing than their generational counterparts, as only 57 percent of millennials say they are aware of their credit standing, compared to 74 percent of generation X and 85 percent of baby boomers. While 80 percent of baby boomers and 62 percent of generation X think their credit standing is within their control, only 51 percent of millennials think so. However, millennials’ knowledge and understanding of their credit scores may soon be on the rise. The survey found that among those who checked their score within the past year, a higher rate of millennials, 54 percent, say that checking their score had a positive impact on their credit behavior, compared to 48 percent of generation X and 41 percent of baby boomers. All figures, unless otherwise stated, are from a YouGov Plc survey conducted on behalf of Discover Financial Services. Total sample size was 2,186 adults (ages 18+). Fieldwork was undertaken March 15-16, 2017. The survey was carried out online. The figures have been weighted and are representative of all U.S. adults. The maximum margin of sampling error was ±2 percentage points with a 95 percent level of confidence. 1FICO® Credit Scores provided by Credit Scorecard are based on data from Experian and may be different from other credit scores. See Discover.com/CreditScorecard to learn more. FICO is a registered trademark of the Fair Isaac Corporation in the United States and other countries.